How does the Echo 58V Electric Chainsaw Compare? The unrelenting technology in various industries has seen a tremendous transition from the use of petrochemical tools to the use of more power tools. Manufacturers have consistently competed to produce the best chainsaw that works flawlessly and performs tasks efficiently. With this competition, the lithium-ion chainsaws were conceived, and of all that stands out, even in other echo chainsaw reviews, the Echo 58V electric chainsaw is the breed to look out for. It comes as a rescue to those who do not like cleaning carburetors and would like to use a chainsaw outdoors without worrying about whether it will start or not. 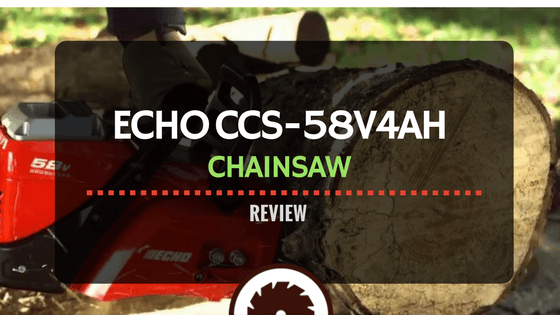 Here is our full Echo 58V electric chainsaw review. One of the notable features about Echo 58V is that it is cordless. It is therefore ideal for outdoor works. It comes with a high-grade cordless chain unlike others in the industry. Its uniqueness is also evident in its brushless motor that has been designed and individually customized to deliver superior power and increase its run time, as well as enhance its durability. It features a 16-inch bar and chain which makes it suitable for cutting trees with large limbs. It also provides aggressive cutting. Furthermore, it comes with side access tensioning feature that makes it easy to adjust the chain. The Echo 58V electric chainsaw has an automatic oiler and a comfortable wrap around handles that renders it highly convenient, not to mention its onboard tool storage. It also comes with a 4Ah powerful lithium ion battery that is easy to recharge, takes about 45 minutes, and its charger. It comes with a 90-day return policy and 5 years of consumer warranty. Above, you can appreciate the Echo 58V electric chainsaw in action. It boasts of power with a 58V and 4.0 Amp hour battery and a 16” Oregon 90 chain. It is fuelled by a battery through a brushless motor with an automatic oiler and a lockout switch. It is also accompanied by a variable speed trigger, motion chain break, and an inbuilt tool storage slot. ​Charging the Echo 58V chainsaw battery takes less than an hour. Although others might find this time as forever, the Echo 58V electric chainsaw is a good choice if you are looking to conserve energy. Its 4Ah lithium ion battery is large enough to cater draining issues of chainsaw power. Consequently, this battery offers a long runtime on one charge with a fast operation. The power is sufficient for cutting down a 40 feet tall tree. You can also limb the tree with the same power. That out of the way, it is true to say that this tool has fairly impressive power, which wouldn’t do best for massive felling of many trees. The stalling out of power as well as the charging time can only be ideal for a homeowner or an arborist with light works. 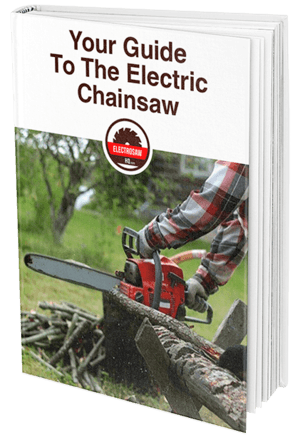 Powering up the Echo 58V electric chainsaw offers no frustrations. Start time is one of the advancements this tool was equipped with and well utilized. Being an electrically powered machine, it has a short start time, and once you hit the trigger, you are ready to go. Of all the electric chainsaws in the market, the Echo 58V electric chainsaw is the only one that features a safety kickback guard tip. This standard kickback chain brake should be appropriately held all the time when using or moving around with the chainsaw. Another safety switch is located on the handle and above the trigger. It is operated by pulling it back before pulling the variable speed trigger. However, its effectiveness comes highly commended, it does have some balance incompatibilities that might hinder you from making deep cuts, but it still is the best choice for an electric chainsaw for you. The operation of the Echo 58V chainsaw comes so easy and friendly with its elegant felling grip and the bucking grip. It has the best trigger with a comfortable feel as its sitting is flush with the handle. This setting is useful for other chainsaws cause discomfort if held for long as the trigger is left protruding when one has already squeezed it. It is well balanced even when one is felling trees. This product is fairly priced and if you consider its capabilities in comparison with the echo chainsaw cs-400, echo CS-370 or the echo chainsaw cs 590, it falls under the margin of the price of the competitive products which isn’t so bad for anyone looking for a one of a kind tool. It is relatively heavy at 13.7 pounds compared to 8.1 pounds of the echo chainsaw cs-310, but way less heavy than the CS-590 which weighs 20.4 pounds and the Echo CS 370 which weigh 15 pounds. Although not to everyone, this weight allows for portability. This electric chainsaw comes with a 56V battery with an Arc-Lithium technology that delivers an incredible amount of power. It comes with a brushless motor and a 14-inch bar and chain that further enhances the efficiency and the performance of this machine. The engine also works in achieving functions like extending the lifespan and the runtime of EGO Chainsaw. However, its performance is below that of Echo Cordless chainsaw, which boasts 58V and the 16” bar and chain. Both have brushless motors, but the Echo Chainsaw is more powerful and efficient. Considering the battery capacity, the Echo 58V electric chainsaw again comes on top. Its 4Ah battery size is enough for some cuts as opposed to the EGO Chainsaw which has a capacity of 2.5Ah battery size. The charging times, however, has the latter disadvantaging the Echo Chainsaw. EGO Chainsaw takes 20 minutes faster than Echo Chainsaw which makes it ideal for saving time. The approximate number of cuts are 100 and 112 respectively. EGO Chainsaw has an incredible and elegant look. It has ergonomic contours and attractive colors as opposed to the Echo Chainsaw. But what is a look compared to the power of a machine? Both are capable of preventing overheating through their brushless motors. Criticized for causing environmental pollution, the gasoline chainsaws are especially amazing in their performance. The Husqvarna 460 is one such chainsaw. How a gas chainsaw compares to an electric chainsaw is best revealed by looking at the Echo vs the Husqvarna chainsaw. Boasting a 60.3cc X-Torq engine, it is the best for dealing with small or heavy cutting projects. Although a little noisy, it won’t come as a surprise if people chose it over the Echo 58V Lithium-ion chainsaw.This chainsaw has an amazing performance and comes with a 20-inch bar and chain. That is 4 inches bigger than Echo 58V Lithium-ion chainsaw measurement! Nonetheless, it comes with a 3-piece forged crankshaft to enhance its durability and for tackling even the toughest jobs. That’s a plus, for it works best where power is required and for longer periods, unlike the Echo chainsaw which might give in to heavy tasks. Whereas Husqvarna 460 Rancher might be used for commercial applications, Echo 58V Lithium-ion Chainsaw wouldn’t be ideal. It has a quick start which competes well with the Echo’s electric and instant start. This gasoline chainsaw further incorporates Air Injection, LowVib, choke and stop control, where the quick release air filter caters for easy cleaning and air filter replacements. Surprisingly, Husqvarna is up to the standard of the Lithium-ion powered chainsaw. Both machines are safe to use and have easily accessed chain tensioners, for effectiveness and high performance. The Husqvarna 460 Rancher is slightly lighter than Echo 58V Lithium-ion Chainsaw making them portable. Husqvarna is way durable though. The only thing that might make you choose Echo 58V Lithium-ion Chainsaw is the price of Husqvarna 460 Rancher. It is almost double the Echo price! All in all, these Husqvarna and Echo chainsaws are best for commercial and home use, respectively. This is another lithium technology chainsaw that competes well with the Echo 58V Lithium-Ion Chainsaw and delivers with cutting speeds of gas power. It comes with a 16-inch bar and chain with an auto-oiling feature for durability like the Echo Chainsaw. It features a 40V Lithium-ion battery that energizes a brushless motor, and it comes equipped with a tool-free chain tensioner and a bar tightening knob for proper clamping and secure bar grip. This is a feature that gives the Echo Lithium ion the competition. Both machines come with variable speed triggers and kickback safety measures for efficiency and smooth work. Whereas the Echo chainsaw is powered by a 58V 4Ah battery, Dewalt Chainsaw comes with a 40V battery with a maximum of 6Ah. They come about the same weight and are portable for outdoor use. However, Dewalt Lithium-Ion Chainsaw is also gas powered. The start times are incredible, and it takes less than a minute before both the machines are up and running. They are quiet, safe and beautifully designed for durability and comfortability while in use. However, the Dewalt Chainsaw has some oiling issues, and despite its many reviews, it still stands out as an issue to note. The pricing favors the Echo Chainsaw where it is way cheaper than the Dewalt Lithium-Ion Chainsaw. Both machines are suitable for light and slightly big jobs if you overlook the longer charging times. The stihl vs echo chainsaw comparison shows a close competition between the two. This particular STIHL Chainsaw boasts 12-inch bar and chain, which is twice what the Echo chainsaw offers. It comes equipped with a powerhouse of 36V that is enough for efficient work around your home. It comes as a partner in property maintenance and cutting firewood. Although not as strong as the Echo 58V Lithium-Ion Chainsaw, it has been designed to produce small vibrations with a low kickback 0.25” saw chain and 12” bar guide for chopping branches around your home. It comes accompanied by a quickstop Super chain brake, a soft handle for comfortability, Stihl chain fast tensioning and a motor that is highly energy efficient. Whereas the Echo Chainsaw offers auto-oiling, this tool balances with Ematic chain lubrication system that provides adequate lubrication to withstand against tear. It also has a less oil consumption that improves its power efficiency. Although the Lithium-ion battery it comes with is in no way closer to the great 4Ah the Echo Lithium Ion packs, it still packs a capacity of 160Wh which is robust and compatible with most of its components. It can be charged severally with no effect, with either AL 100 standard charger or the AL 300 quick charger. Like many other battery chainsaws, the batteries and the chargers of these two chainsaws are proprietary and must be bought separately. Otherwise, they come as empty shells. Stihl MSA 160 C-BQ is way lighter that the Echo chainsaw which makes it highly portable. They both have about the same price range. If you asked me, I would say the Stihl chainsaw is overpriced considering its limitations on what it can achieve. Nonetheless, both chainsaws have protection measures in place which makes them safe to use. They also produce less noise. The total runtime of Stihl Chainsaw is 50 minutes. If you are looking for a chainsaw that will help you around your home, then STIHL 160 C-BQ Cordless chainsaw is your tool. It is best for domestic purposes. However, it will be a disadvantage if you want to do slightly heavier tasks around your home. In this case, the Echo 58V 16” Lithium-Ion Chainsaw will be the best chainsaw.